It’s gotta be incredibly difficult to remain enthusiastic when you do the same exact thing every single night. That’s the best explanation I have for why tours like THE LION KING and NEWSIES seem so tired when they come through town. So I wonder what the secret to keeping THE BOOK OF MORMON, playing through this weekend at the Aronoff Center, so lively is? This is the third time I’ve seen this touring show; the first was at the Aronoff Center last time it was in town. Then I saw it again in Dayton. And I saw it on Wednesday. This was by far the best experience I’ve had with the show. The first time I saw it I was uncomfortable; the humor is very brash and incredibly sacrilegious. But my second trip through THE BOOK I knew what to expect and I appreciated the show a little more. This time I was able to focus on the skillful and artful way the show shows its reverence for religion, despite poking fun at Mormonism and other religious ideas. And I got to see some excellent performances. Cody Jamison Strand is an absolute delight as Elder Cunningham, stealing the show with his comic timing and perfect wit. 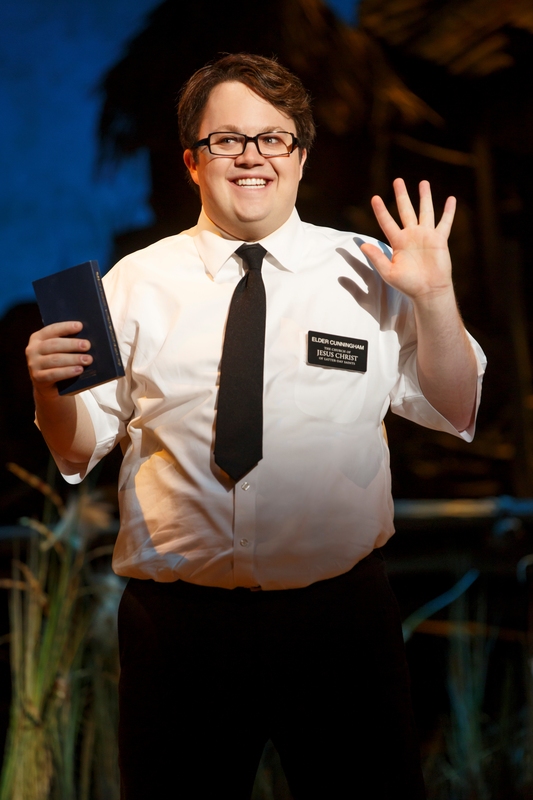 But without Ryan Bondy as Elder Price to play off of, Strand wouldn’t be as magnificent. Bondy is a good singer, a great dancer, and an excellent actor. His presence exudes confidence and I believed everything he did on stage. Also excellent was the work of Candace Quarrels, who’s soaring vocals are a highlight of the show’s more tender moments. This show features several CCM graduates including Eric Geil, Eric Huffman, and Melvin Brandon Logan, who’s turn as “The Doctor” had me in stitches. Also in the show from Cincinnati is JR Bruno who was swung out of the performance I saw. The entire ensemble was energetic, on point with their humor, and the sold out crowd was laughing hysterically. Perhaps that’s the secret to the cast’s enthusiasm . . . an equally enthused audience? Whatever the secret, they need to share it with their fellow blockbuster tours. THE BOOK OF MORMON runs through April 3rd at the Aronoff Center. Mature themes and very adult humor are rampant. More information can be found here.